In vintage Rolex watch collecting circles, the Daytona is basically a brand on its own. In fact, Paul Newman’s (the man responsible for popularizing old-school manual-wound Daytona watches with Rolex’s Exotic dials) very own vintage Rolex Daytona set a new world record for the most expensive wristwatch sold at auction when it fetched $17.8 million. But what about modern Rolex Daytona chronographs; how will they fare 30 years from now in the watch collecting community? In this latest installment of the Modern Rolex, Future Classics series, we’re outlining why we think the Daytona ref. 116520 will be a future collectible. The history of the Rolex Daytona chronograph can be divided into three main generations. The first, which launched in 1963, ran on manual-wound movements and sported cases measuring around 38 mm. Then in 1988, the second generation of Daytona watches made its debut with larger 40 mm cases. These versions ran on automatic chronograph movements based on the famous Zenith El Primero caliber. And finally, in 2000, Rolex introduced the third generation of the Daytona, which had a similar look and size but boasted an in-house automatic movement. The Daytona ref. 116520 was part of that third generation equipped with Rolex’s Caliber 4130 chronograph movement. This is the full stainless steel Daytona edition with a 40 mm Oyster case topped with a stainless steel bezel engraved with a tachymeter bezel. Similar to the preceding version, the Daytona ref. 116520 includes screw-down chronograph pushers and a screw-down winding crown to ensure the watch’s 100-meter water resistance. Rolex offered the Daytona ref. 116520 with a choice of a black dial with silver counter rings or a white dial with the same silver ring counters. The white gold applied hour markers on the dial are filled with luminescence, as are the hour and minute hands. Depending on the production date, the lume can either glow green in the dark (SuperLuminova) or blue in the dark (Chromalight). The switch to Chromalight began around 2013. The Rolex Daytona ref. 116520 is paired with a matching steel Oyster bracelet with solid center links. The Fliplock clasp is fitted with an Easylink extension system to quickly add another 5 mm to the bracelet when needed. Rolex ceased production of the full steel Daytona ref. 116520 in 2016 and replaced it with the steel Daytona ref. 116500LN with a black Cerachrom ceramic bezel. Why Will The Rolex Daytona 116520 Be A Future Classic? Despite the fact that the Rolex Daytona 116520 was in production for 16 years, it was never an easy watch to get from an authorized dealer. As a steel Daytona chronograph with an in-house automatic movement, the 116520 was always a sought-after Rolex model and demand for it consistently outpaced supply. Looks-wise, the design of the Daytona 116520 remained constant for its entire production run (except for the luminous material, which we mentioned above)—a testament to its timeless style. 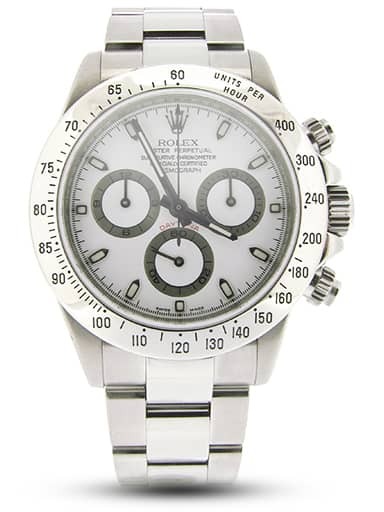 When the Daytona 116520 was first introduced in 2000, its retail price was around $6,000. The last retail price of the Daytona ref. 116520, before it was discontinued in 2016, was $12,200. Adjusting for inflation, that $6,000 is actually worth about $8,500 in 2016. Therefore, if we compare $8,500 to $12,000, the retail price of the Daytona ref. 116520 increased by 43.5% over its 16-year run (approximately 2.75%/year). However, since the Daytona was not an easy model to find in stores, it typically traded at a higher value in the secondary market. And today, three years after Rolex stopped making it, the now-discontinued Daytona ref. 116520 sells anywhere from $15,000 to $25,000 in the pre-owned Rolex market. It’s clear that the value of the Daytona ref. 116520 has been on the rise and since supply has completely stopped, it would not be surprising if its value continues to go up. As such, while there are no sure bets, the only full stainless steel Daytona that runs on an in-house chronograph movement ever made—aka the 116520—is headed in the right direction to become a future classic collectible.